Last night I took my husband Jake to Blueberry Hill for his birthday. 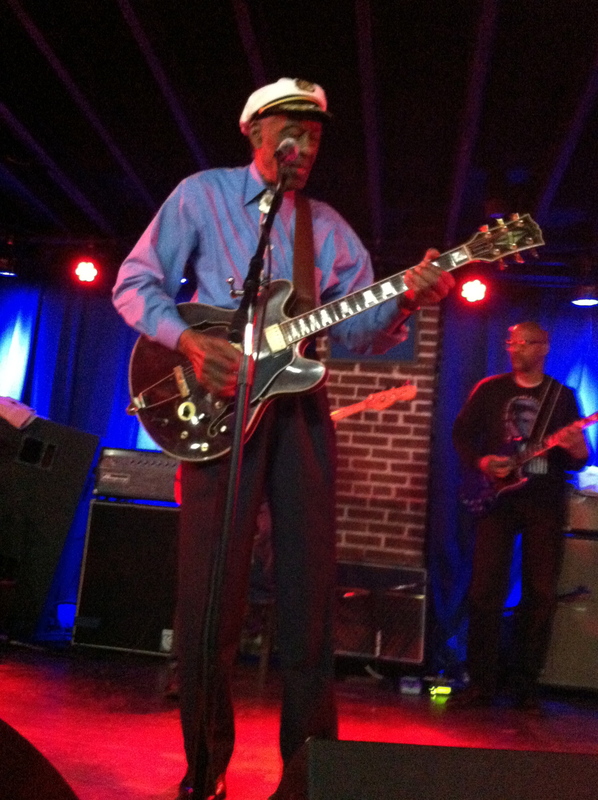 We were able to see Chuck Berry perform in the Duck Room after trying to get tickets for five or six years. Since Chuck performs only once a month, you have to gp online immediately as soon as sales start to buy tickets. It was worth the wait: Chuck is 87 and still rockin’ and rollin’. I loved his music when I was a teenager and he was wild and free. I loved him yesterday too. This is certainly a tamer Chuck than the guitar legend. We sat front-row-center and could see how management puts a list of songs with keys in huge letters on the floor. He got the key wrong once anyway to the annoyance of Charles Berry, Jr. who performs along with his Dad and sister Ingrid. Right key, wrong key, April 23rd was Chuck’s 203rd consecutive performance at Blueberry Hill. How cool is that? Sometimes my husband and I come home from a party just as my children are going out. Well I remember being young and staying out late. Now, in the prime of my middle age, I cannot imagine anything worse. As far as a mood elevator, a good night’s sleep is my drug of choice. I have made some radical changes in lifestyle in the last ten or twelve years to support my sleep habit. The most difficult change was giving up coffee. I do love a good cup of java. In the old days, coffee was my reason for getting up in the morning. But I read an article that said I would lose ten pounds if I switched from coffee to green tea. (I did lose nine pounds, but that’s another story.) The first two weeks I had terrible headaches. Caffeine is a vasodilator so I guess all the veins in my brain were constricting. Nevertheless I persisted coffee-less because I realized the immediate benefit of not waking up to pee so often. How sweet it is to sleep through the night. Another change I made is going to bed at the same time every night and getting up at the same time every morning. I clock out between nine and ten and bound out of bed between five-thirty and six. Too early for most, but it works well for me. I sleep so much better than the old days when I would stay up past midnight and then try to sleep in. Light and noise just interrupt my shuteye once the day dawns. Lori puts a high priority on sleep too. It is one of the spokes of her wheel of attack on Parkinson’s. Parkinson’s Disease messes with sleep big time. P.D. can cause R.E.M (Rapid Eye Movement) Sleep Disorder that creates unique sleep disturbances where people act out their dreams. To them, their dreams are real. When people have this symptom of Parkinson’s dream, it’s not passive. In Lori’s case, sometimes she talks a lot; others she does what she is dreaming. Bob says, “Once I woke her up because she was choking me with the chord from my sleep apnea device. When I asked her why, she said, ‘You’re the dog. I am taking you for a walk.’” It was nothing personal. My father died form Alzheimer’s and now my mother has dementia. With this genetic inheritance, I read everything I can about taking care of your memory. Yesterday I posted a list of foods that improve memory: salad oil, fish, dark-green-leafy vegetables, avocados, sunflower seeds, peanuts, red wine, berries, and whole grains. I was mildly shocked because I eat all these foods except sunflower seeds as much as I can because I like them. Better double down on sunflower seeds. I also do Sudoko every day. Research says Sudoko and crossword puzzles make new memory connections. “My guess is that playing them activates synapses in the whole brain, including the memory areas,” says Marcel Danesi, PhD, author of Extreme Brain Workout. Whereas scientists used to believe brain development was static after a certain age, they now recognize neuroplasticity – the brain can develop new pathways. Games and memory exercises encourage neuroplasticity. I learned long ago that I think better after I exercise so I do my best to get some form of vigorous activity before I write. I try to exercise every day, but many weeks I can only do six days. Three times a week I practice a workout routine with a half hour on the bike, plus weights, crunches and stretches. I mix it up with yoga, tennis and three-mile walks with friends. I feel like it gets the blood pumping to my brain. Since I figured this routine out myself, I was deeply interested to learn that exercise is a key part of Lori’s attack on Parkinson’s. Her specialist, Dr. Michael Rezak, says that Lori’s exercising has definitely slowed the progress of the disease. Lori dedicates four hours a day to exercise. She stretches when she gets up. For endurance and strength, she walks on the treadmill and lifts weights. 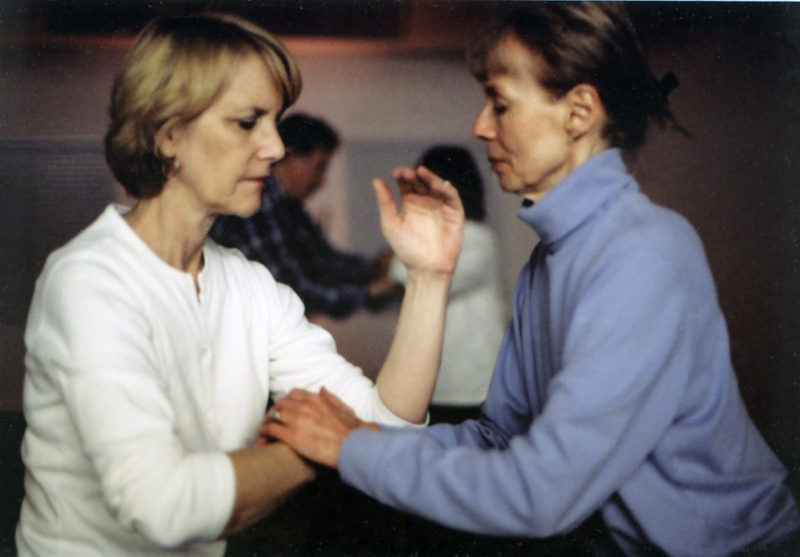 Ballroom dancing and tai chi improve balance. Lori plays the harp develops finger control so Lori can help prevent the trembling hands that are a symptom of her disease. As a former aerobics instructor, all this comes naturally to Lori. While P.D. has taken away many things she liked to do, like biking, skiing or roller blading, but she is so much better that she can play golf again. I have Alzheimer’s in my family. I hope the same goes for Alzheimer’s.